First, “Europe” is actually a lot of different countries in a lot of different situations. Second, much of what seems to work over there only does so because it’s being financed with ever-increasing amounts of debt. 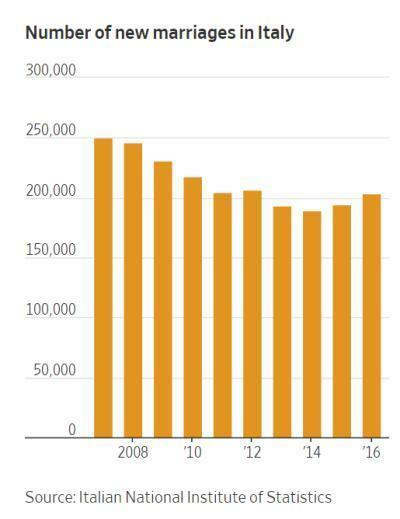 For countries, as for individuals, borrowing money is fun at first but beyond a certain point becomes debilitating, as interest payments begin to crowd out everything else. 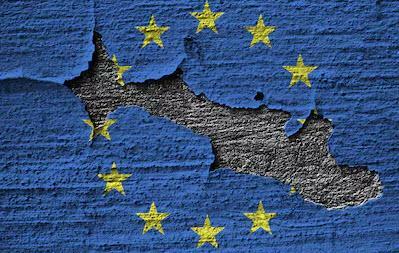 That’s where a growing number of Europe’s failed states now find themselves, with overly-generous pensions and overly-restrictive labor laws making it virtually impossible to run a functioning market-based economy. The result: Fewer good jobs and more frustrated voters – especially young ones who have seen only the downside of the current system – and the resulting rise of populist political parties that recognize the problems without offering coherent solutions, thus guaranteeing even more chaos in the future. 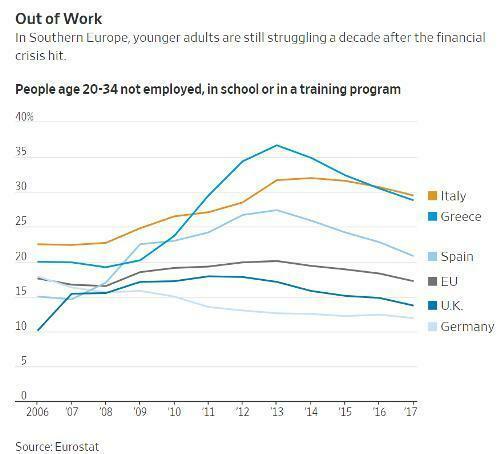 As Today’s Wall Street Journal notes, in Italy and Greece, nearly a third of young adults not only aren’t working but aren’t enrolled in school or training. What are they doing? Apparently just sitting around and stewing about life’s injustice. 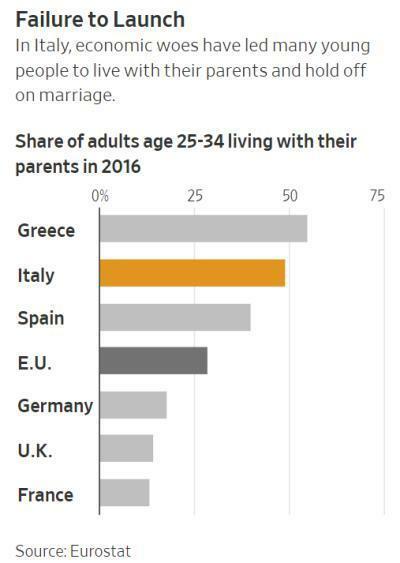 As for where they’re sitting and stewing, in Greece, Italy and Spain it’s now normal for adults all the way into their 30s to live with their parents, largely because they can’t find work that pays enough to afford a house, car and other requirements of independent life. Not surprisingly, they’re also failing to attract mates — because who wants to marry an unemployed 30-year-old who lives with his or her parents? Add it all up and you get fertile ground for politicians willing to promise a quick fix. In Italy, the populist 5 Star Movement and League parties won a combined majority of the youth vote and now run the show. In Spain, 40% of voters under 35 are, according to polls, leaning towards the far-left party Podemos and its political allies. In Greece, more than 41% of those age 18 to 24 voted for far-left Syriza in the 2015 election. As for Germany, which looks great by comparison, keep in mind that a big part of its economic outperformance is due to other EU countries borrowing huge amounts of money to buy German exports. When the latter run out of money – a point which is clearly coming – Germany suffers twice, once when it loses important customers and again when its banks, having lent trillions of euros to Italy, Spain, et al, have to eat those losses. But bad-mouthing Europe should not be seen as implicit praise of the US. We, like Germany, have an advantage that’s both unfair and temporary. Where Germany has trading partners willing to borrow big to buy Mercedes and Beemers, the US has the world’s reserve currency, which acts as an unlimited credit card for our entitlement state and military/industrial empire. Slightly different scams, same eventual result: the credit spigot gets turned off and all hell breaks loose.